"I didn't deserve forgiveness…" Warner Bros has debuted the first official trailer for Clint Eastwood's new film The Mule, which has been scheduled for release in December of this year. This is Eastwood's second film this year, following The 15:17 to Paris earlier this year. And he also stars in this one. Eastwood plays a 90-year-old horticulturist and WWII veteran who is surprisingly caught transporting $3 million worth of cocaine through Michigan for a Mexican drug cartel. The full cast includes Bradley Cooper, Laurence Fishburne, Michael Peña, Dianne Wiest, Andy Garcia, plus Alison Eastwood, Taissa Farmiga, Ignacio Serricchio, Loren Dean, and Eugene Cordero. I like the cold opening to this trailer, makes it thrilling right away. This looks quite good, at least the story does. Might be interested in watching this one. Eastwood stars as Earl Stone, a man in his 80s who is broke, alone, and facing foreclosure of his business when he is offered a job that simply requires him to drive. Easy enough, but, unbeknownst to Earl, he’s just signed on as a drug courier for a Mexican cartel. He does well—so well, in fact, that his cargo increases exponentially, and Earl is assigned a handler. But he isn’t the only one keeping tabs on Earl; the mysterious new drug mule has also hit the radar of hard-charging DEA agent Colin Bates. And even as his money problems become a thing of the past, Earl’s past mistakes start to weigh heavily on him, and it’s uncertain if he’ll have time to right those wrongs before law enforcement, or the cartel’s enforcers, catch up to him. The Mule is directed by veteran actor/filmmaker Clint Eastwood, of the films Gran Torino, Invictus, Hereafter, J. Edgar, Jersey Boys, American Sniper, and Sully most recently. The screenplay is written by Nick Schenk. 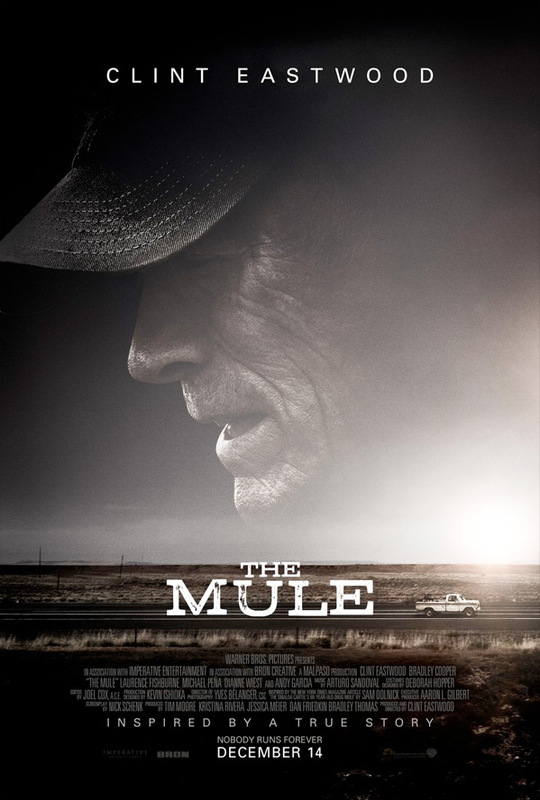 WB will release Eastwood's The Mule in theaters starting December 14th this fall.